Sweet and juicy or crisp and crunchy, pears make an easy snack or dessert that delight the senses this time of year when they reach perfection. If you are lucky enough to come across local pears, stock up! New Hampshire-grown pears are often smaller yet more flavorful than their long-traveling counterparts. The local season for pears has generally passed; however, you'll find a great selection of fresh local and organic storage pears in stores now. We have friends in Manchester with a prolific pear tree that require us to bring home a laundry basket full each September. It’s always a mad dash to eat or prep them all before they go bad! Of course we’re grateful for the bounty; it’s become one of our fall rituals and introduced us to a variety of ways to enjoy the fruits. Storing Pears: We immediately store most of the pears in the fridge and reserve a bowl to ripen on the counter as a functional autumnal decoration that reminds us to eat a few each day. Pears are best picked slightly underripe and will ripen within a few days at room temperature. Every day or two, we pull some extras out for the bowl. Underripe pears will only last about a week or so in the fridge, so it’s helpful to process the surplus to enjoy throughout the winter. Preserving Pears: Our favorite way to work our way through the surplus is to dehydrate them. Dried pears are a delicious treat that are even sweeter than apple chips with a great chewy texture (reminiscent of the candy I love but try not to eat). 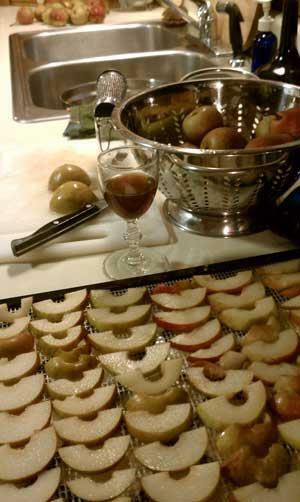 I cut ripe pears into 1/8-inch slices and fill my dehydrator trays to the gills. They require no special prep, but I often sprinkle them with freshly grated nutmeg or some cinnamon to further enhance the flavor. You’d be amazed how many pears fit into a quart-sized mason jar once dehydrated and how quickly they get gobbled up! We also freeze pears, much the same way we freeze apples: cored, sliced, and frozen in vacuum-sealed or Ziplock bags with as much air removed as possible. They’ll last for at least a year and can be pulled out as needed for pies, cobblers, crisps, and other recipes. If the peels bother you in finished baked goods, peel them before freezing. We’ve also learned to make a few fun specialty foods with pears that are great for gatherings and gifts. “Pear Butter” is made almost like applesauce, adding extra spices like minced ginger root, nutmeg, and cloves. It’s great over vanilla ice cream, on pancakes or waffles, and on harvest-time roasts like chicken. You’ll find lots of recipes online. I also make Pear Cordial annually, which my students say is the best-tasting “herbal remedy” I pass around in classes. Sip it from a cordial glass or use it in seasonal cocktails like warmed, spiked cider with a cinnamon stick. This recipe makes about one pint of cordial and will keep for at least one year in the liquor cabinet. You can easily double or triple the batch. My family takes Thanksgiving so seriously that they even give out party favors. I’ll be making an extra large batch of this cordial this year so everyone can go home with a bottle! Simmer the pears and spices in the maple syrup and water for approximately one hour. Remove from heat occasionally if it seems to be boiling too hard. Pour all the ingredients into a mason jar. (Remove the cinnamon sticks if you want the cinnamon flavor to remain subtle.) Cover with vodka, cap, and let sit on the counter for one to four weeks, shaking daily. Taste it every few days. The flavor will gradually change, becoming more spicy and less fruity/nutmeg-y over time. When it tastes good to you, strain your cordial into bottles, and enjoy! I like it best within just a day or two. * I highly recommend the Flag Hill’s General Stark Vodka, which is made with apples from Apple Hill Farm in Concord. You’ll have to get it at their vineyard in Lee or a state liquor store. Get inspired by great food, try new recipes, and learn healthy cooking techniques. The statements made on our blog have not been evaluated by the FDA and are not intended to diagnose, prescribe, recommend, or offer medical advice. Please see your health care practitioner for help regarding choices.